Some incompatibilities have been introduced, but they are documented (to address corner cases where the syntax can be confusing). Bottom line: all these markups are easy to use and it takes 5 minutes to learn one of them, as long as it is documented. Ill-suited for technical papers, though. No math support, no syntax highlight, but well-suited for general prose and even poetry. It has every feature one could expect from a lightweight markup: images, sectioning, footnotes, simple tables, bold, italics, subscript, superscript, lists, verbatim, quotations. So far proved itself good and expressive. Need to convert the HTML to Muse, preserving as much as possible the logical structure of the document (and discarding the noise). Need some common search-and-replace patterns (like typographical quotes, text cleaning). muse-compile.pl script is shipped with Text::Amuse::Compile, so you can generate the formats from the command line. Texts themselves are self-contained. 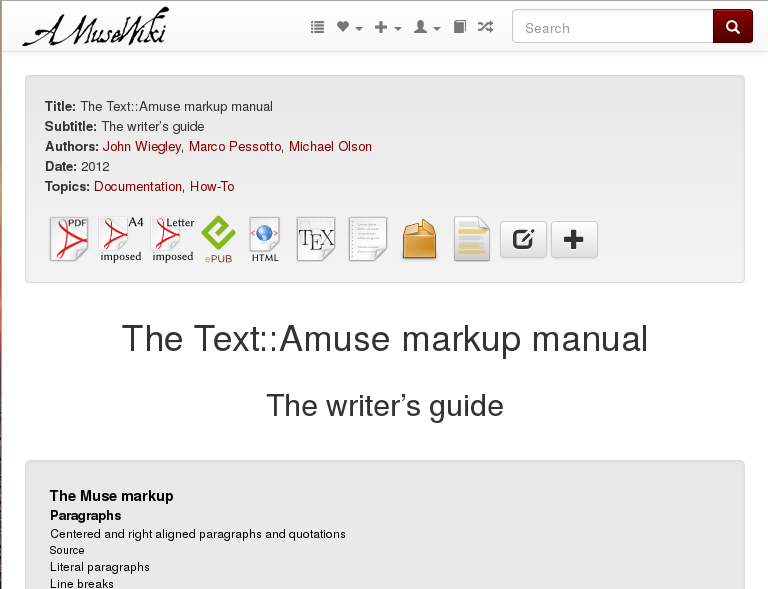 All the information describing the text (like author, title, categories) is stored in the header of the text. 1 text (even a whole book), 1 file. Full text search: Xapian (light, fast, fairly simple to setup, well integrated in Perl with Search::Xapian). A daemon takes care of all the operations which are slow or somehow delicate where concurrent access could be a problem (text compilation, publication, indexing, Git interaction). Formats are pregenerated, including the HTML. The frontend just serves them. The backend and the frontend communicate via a job queue in the database. Some message queue systems were examined, but resorted to use the database because it was the most straightforward and other solutions looked like over-engineering. Catalyst application: chaining, method-to-uri mapping, actively developed, great community, back-compatibility approach. Localization via Catalyst::Plugin::I18N (plus local overriding via local JSON file). Localized for English, Italian, Croatian, Macedonian, Russian, Finnish, Swedish, German, Spanish. Multisite: on one instance you can run as many sites as you want (this was the most compelling argument to write AmuseWiki). Kept at minimum reusing existing solutions. No hierarchical structure: each librarian can create other peer librarians (plus root for site management) with the same level of privileges. Custom files are compiled by the backend, even if the users sees the live logs and the process is pretty fast. EPUB output if required, with embedded fonts. Drupal + filtered HTML, texts kept in sync on a local Git repo with scripts. Obviously it wasn’t a brilliant idea, to be generous. Same filtered HTML inherited from Drupal, plus home-brewed CGI scripts. It kind of worked. Dancer application and Emacs Muse markup, no database. Worked, but didn’t scale with multisite.